Cupcakes are so popular right now. There's something so special about an individual, beautifully decorated cake. But today's cupcakes are much more upscale than the ones your mom made for you to take to the Brownie meeting after school. The cupcake is all grown up now and is even suitable for weddings. Stores and bakeries are devoted entirely to the cupcake. Luckily, you don't have to be a master decorator to get amazing cupcake results. Today, I'm going to share some great resources I found to make your cupcakes beautiful. 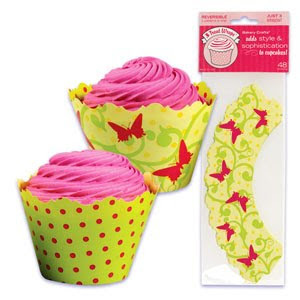 The simplest decoration or plain icing will look elegant with pretty cupcake liners. 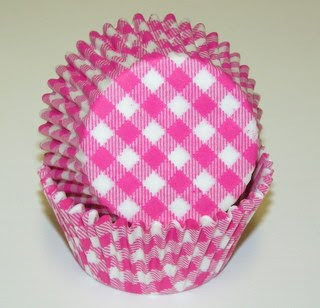 These pink and white gingham are so pretty. The scalloped edge on these is so delicate. 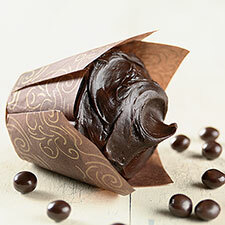 Wrap cupcakes in a sleeve for a festive look. 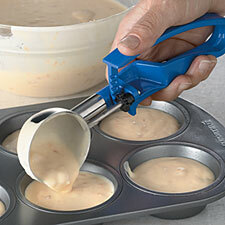 A scoop will help you to measure the perfect amount of batter in each cupcake. 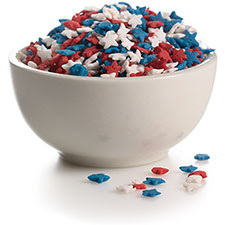 A simple silver or white papered cupcake is perfectly patriotic with the red, white, and blue star confetti. This would be so cute for a Memorial Day or 4th of July party. 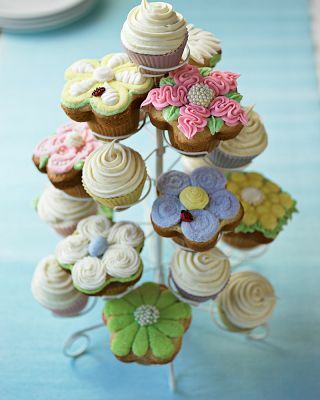 Display your cupcakes in style with these cupcake stands. MLG from the Pink Washingtoniette and I were talking about cupcakes the other day and love them for a party idea. Have you ever served cupcakes at a party instead of cake? How did you decorate them? P.S. Remember that today is the last day to enter the first Village Palm Anniversary giveaway! Enter all 4 of last week's giveaways for your chance to win some fantastic prizes. Cupcakes are handfuls of perfection, really. Aren't they?! Love the idea of cupcakes at a shower! So much easier than cutting a cake. I actually used cupcakes at a bridal shower I threw for a friend about two months ago. 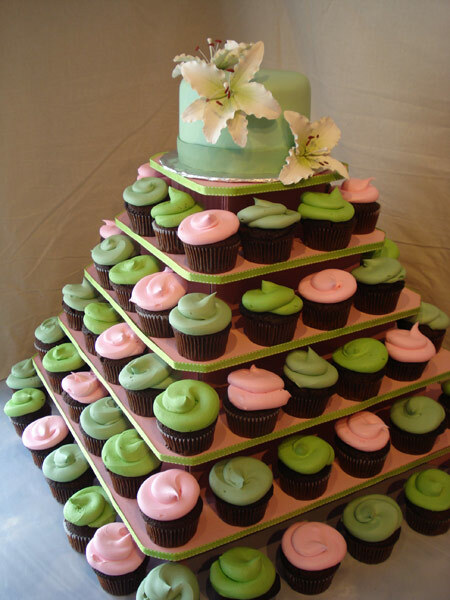 I just went with the classic floral decoration, and showed them off on a pretty cupcake stand. I borrowed the stand then, but now that I'm thinking about it, I probably should get one to have for whenever I may need it again. :) We have one cupcake store here in town called "Polka Dot." So cute! This post is perfect timing! 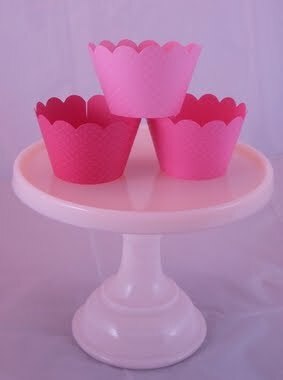 I am getting ready to throw a pink cupcake themed party for my daughters first birthday! I will be spending the next few weeks perfecting my cupcake icing skills!! The first picture you posted is great inspiration. Have a great day! I love cupcakes so much! 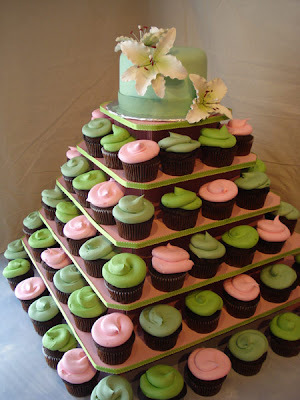 For my wedding, I plan on doing both a cake and mini cupcakes with pink and green frosting! With the help of two friends we made 300+ cupcakes for a wedding. It was pretty crazy, In the end we decided that with what we spent getting the ingredients, we could have gotten a bakery to make them - and maybe have had time to style our hair before the ceremony (instead of icing cupcakes at the last minute). It was fun and a great memeory! LOVE the cupcake! i serve cupcakes a lot more than cake these days: red velvet for my parents recent 40th anniversary party; ice cream cupcakes at muffy's bday; birthday cupcakes for grammy's 70th bday party, etc. No party goer can resist...and Reynolds (yes, the company that makes 'wrap') makes the cutest pink and green plaid paper holder! check THAT out for a preppy little cupcake! I could give up regular cake completely and just have cupcakes for the rest of my life! They're the perfect size, and are so darm cute! For Fat Tuesday, all my co-workers and I decided to bring in different types of cupcakes to celebrate! Everyone made such delicious treats! I made red velvet from Martha's Cupcake book. Divine! Check thei out - and they feature Annapolis! Website still being contructed but she's doing Farmer's Markets in DC and Maryland!!! I received a cupcake stand as a Teacher Appreciation gift last week... can't wait to put that cute thing to work! I actually did a cupcake tree for my sons christening. I used blue and white polka dot liners and large blue and white dragees. I also made tiny butter cookies in the shapes of crosses and doves and iced them in blue and white and placed one on top of each cupcake. They turned out really cute. I also do cupcakes every 4th of July for a big bash. The cupcake is the perfect food! I'm seeing more and more cupcakes being served (instead of cake) at children's parties. So much easier!